วันเสาร์ที่ 08 ตุลาคม 2016 เวลา 06:28 น. 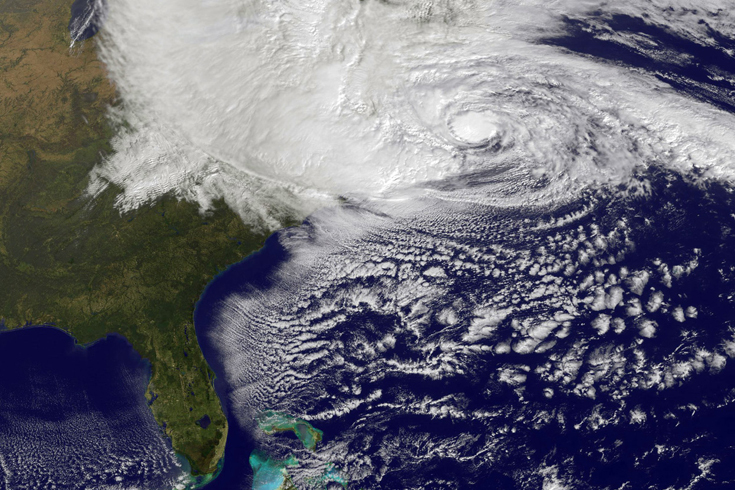 Was Megastorm Sandy a freak combination of weather systems? Or are hurricanes increasing in intensity due to a warming climate? How did this perfect storm make search and rescue so dangerous? "Inside the Megastorm" takes viewers moment by moment through Sandy, its impacts, and the future of storm protection. Through first person accounts from those who survived, and from experts and scientists, "Inside the Megastorm" gives scientific context to a new breed of storms. Hurricane Sandy (unofficially referred to as "Superstorm Sandy") was the deadliest and most destructive hurricane of the 2012 Atlantic hurricane season, and the second-costliest hurricane in United States history. 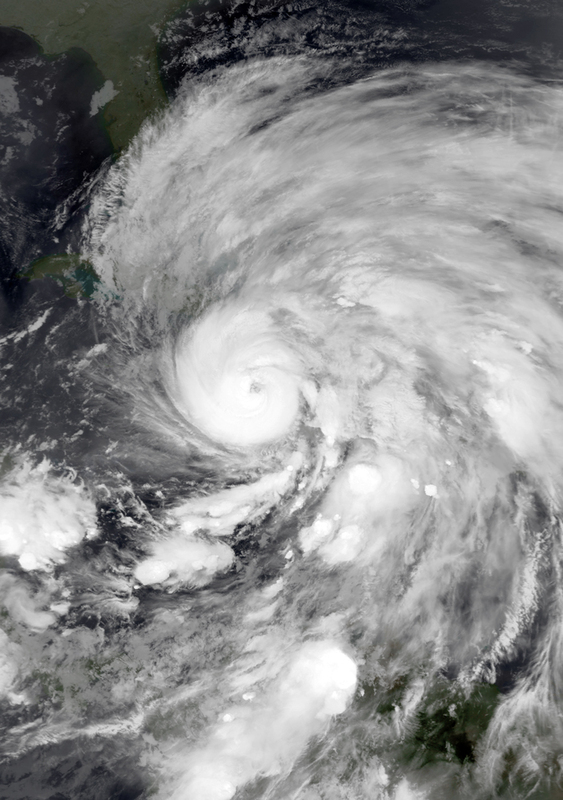 Classified as the eighteenth named storm, tenth hurricane and second major hurricane of the year, Sandy was a Category 3 storm at its peak intensity when it made landfall in Cuba. While it was a Category 2 storm off the coast of the Northeastern United States, the storm became the largest Atlantic hurricane on record (as measured by diameter, with winds spanning 1,100 miles (1,800 km)). Estimates as of 2015 assessed damage to have been about $75 billion (2012 USD), a total surpassed only by Hurricane Katrina. At least 233 people were killed along the path of the storm in eight countries. In Jamaica, winds left 70% of residents without electricity, blew roofs off buildings, killed one, and caused about $100 million (2012 USD) in damage. Sandy's outer bands brought flooding to Haiti, killing at least 54, causing food shortages, and leaving about 200,000 homeless; the hurricane also caused two deaths in the Dominican Republic. In Puerto Rico, one man was swept away by a swollen river. In Cuba, there was extensive coastal flooding and wind damage inland, destroying some 15,000 homes, killing 11, and causing $2 billion (2012 USD) in damage. Sandy caused two deaths and damage estimated at $700 million (2012 USD) in The Bahamas. In Canada, two were killed in Ontario and an estimated $100 million (2012 CAD) in damage was caused throughout Ontario and Quebec. In the United States, Hurricane Sandy affected 24 states, including the entire eastern seaboard from Florida to Maine and west across the Appalachian Mountains to Michigan and Wisconsin, with particularly severe damage in New Jersey and New York. Its storm surge hit New York City on October 29, flooding streets, tunnels and subway lines and cutting power in and around the city. Damage in the United States amounted to $71.4 billion (2013 USD). In Canada, two were killed in Ontario and an estimated $100 million (2012 CAD) in damage was caused throughout Ontario and Quebec. 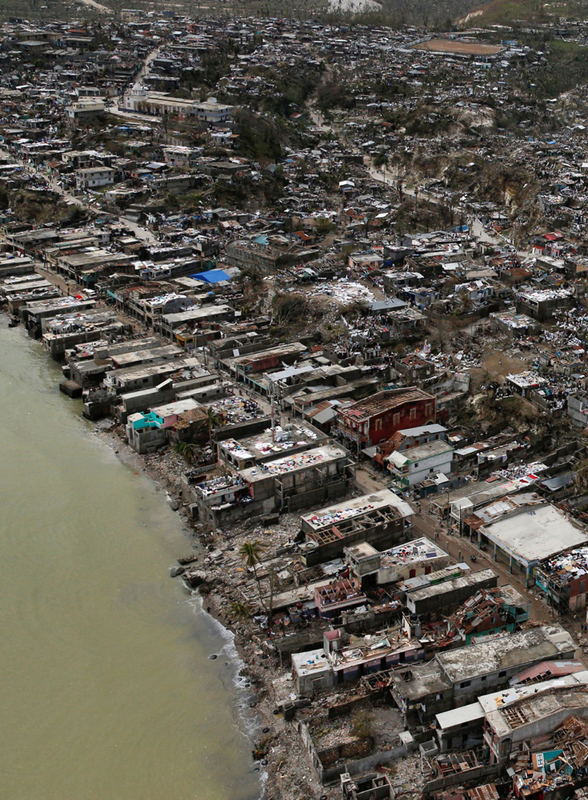 Homes destroyed by Hurricane Matthew in Jeremie, Haiti, October 6, 2016. Hurricane Matthew is currently a strong tropical cyclone that impacted Haiti, Jamaica, Cuba, Dominican Republic, and The Bahamas, and is moving along the east coast of the southeastern United States, especially Florida, as well as Georgia, South Carolina, and North Carolina. It was the first Category 5 Atlantic hurricane since Hurricane Felix in 2007. The fourteenth tropical cyclone, thirteenth storm, fifth hurricane and second major hurricane of the annual hurricane season, Matthew formed from a vigorous tropical wave that moved off the African coast on September 22, progressing on a westward track until it developed into a tropical storm while it was situated just to the east of the Leeward Islands on September 28. A day later, it became a hurricane while west of the Leeward Islands, and rapidly strengthened into a Category 5 hurricane. At least 887 deaths have been attributed to the storm, including 877 in Haiti, making it the deadliest Atlantic hurricane since Stan in 2005, which killed more than 1,600 in Central America and Mexico. On October 6, U.S. President Barack Obama declared a federal state of emergency for Florida. The federal disaster declaration was later extended to include Georgia and South Carolina. (CNN)As Hurricane Matthew continues to churn through the Atlantic, leaving more than 260 dead in the Caribbean and threatening the Florida coast, the focus must be on public safety. People in the storm's path must seek refuge, as Florida's governor has implored. And those in the Caribbean likely will need assistance as they mourn their dead and clean up the wreckage. But as the impact of the storm becomes clear, there's an uncomfortable truth the rest of us should wrestle with: Hurricane Matthew looks a lot like future climate change. And if we want to stop storms like this from getting even more intense, we need to do everything we can to rid the economy of fossil fuels. "We expect to see more high-intensity events, Category 4 and 5 events, that are around 13% of total hurricanes but do a disproportionate amount of damage," Kerry Emanuel, a professor of atmospheric science at MIT, told The Guardian. "The theory is robust and there are hints that we are already beginning to see it in nature." "Last year was the warmest our oceans have ever been on record. And that's critical context," Michael Mann, a professor of atmospheric science at Penn State University, told Democracy Now. "It's that warmth that provides the energy that intensifies these storms. And it isn't a coincidence that we've seen the strongest hurricane in both hemispheres within the last year." Emanuel, the MIT professor, told me it's not possible to say Hurricane Matthew was caused by climate change. We just don't know that. But we do know that by burning coal, natural gas and oil we are heating up the atmosphere and oceans, and that's expected to strengthen hurricanes like this over time. By 2100, tropical hurricanes are expected to be 2% to 11% more intense because of global warming, according to the National Oceanic and Atmospheric administration, citing UN data. Global warming also is expected to make hurricanes produce about 20% more rain near the eye of the storm, according to a US government report. That's critical because freshwater flooding is the second deadliest feature of hurricanes, Emanuel told me. 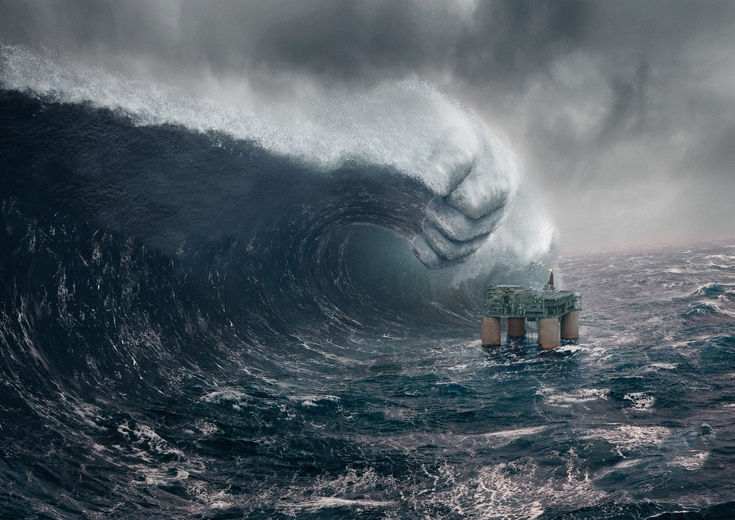 The top killer is storm surge, he said, and that also will be shaped by our fossil fuel addiction. As the planet heats up, the ocean is expanding and ice sheets are melting from the land into the sea. That's causing already noticeable increases in tide lines, leading to sunny-day flooding in Miami and Norfolk, Virginia, for example, as tides spill into streets and yards. Rising tides make hurricane storm surges even higher, causing greater risks for people living on the coast. "Within the next 15 years, higher sea levels combined with storm surge will likely increase the average annual cost of coastal storms along the Eastern Seaboard and the Gulf of Mexico by $2 billion to $3.5 billion," a 2014 report from the Risky Business Project, chaired by Michael Bloomberg, Henry Paulson, and Tom Steyer, found. "Adding in potential changes in hurricane activity, the likely increase in average annual losses grows to up to $7.3 billion, bringing the total annual price tag for hurricanes and other coastal storms to $35 billion." The decisions we make about our energy use today will define how deadly and costly hurricanes like Matthew will be for many generations to come. We ignore these warnings at our peril. In October 2012, Megastorm Sandy cut a path of devastation across the Caribbean and the East Coast, killing hundreds and doing tens of billions of dollars in damage. To many, it was a wake-up call. Now, one year after Sandy's deadly strike, NOVA follows up on the 2012 film "Inside the Megastorm" with a fresh investigation of the critical questions raised by this historic storm: Was Megastorm Sandy a freak combination of weather systems? Or are hurricanes increasing in intensity due to a changing climate? What can we do to prepare ourselves for the next Sandy, and what progress has been made toward making our urban infrastructure more resilient? Much of Sandy's wrecking power was due to an extreme storm surge that left large swaths of New York and New Jersey underwater. And with sea levels on the rise, flooding will only become more frequent. NOVA examines the role of climate change in driving these rising seas, and looks at some of the latest extraordinary engineering employed in other areas, as well as what it may take to make cities like New York more resilient in the future. Several media organizations contributed to the immediate relief effort: Disney–ABC Television Group held a "Day of Giving" on Monday, November 5, raising $17 million on their television stations for the American Red Cross and NBC raised $23 million during their Hurricane Sandy: Coming Together telethon the same day. On 31 October 2012, News Corporation donated $1 million to relief efforts in the New York metropolitan area. As of December 2013 the NGO Hurricane Sandy New Jersey Relief Fund had distributed much of the funding raised in New Jersey. In March 2014, Newsday reported, that 17 months after the hurricane people displaced from rental units on Long Island faced unique difficulties due to lack of affordable rental housing and delays in housing program implementations by New York State. Close to 9,000 rental units on Long Island were damaged by Hurricane Sandy in October 2012, and Hurricane Irene and Tropical Storm Lee in 2011 per the NY State Governor's Office of Storm Recovery (GOSR). New York State officials said that additional assistance would soon be available from the HUD´s Community Development Block Grant funds via the New York Rising program. On March 15, 2014, a group of those who remained displaced by the hurricane organized a protest at the Nassau Legislative building in Mineola, New York, to raise awareness of their frustration with the timeline for receiving financial assistance from the New York Rising program. As of March 2014, the GOSR released a press statemnet, that the New York Rising Community Reconstruction Program had distributed more than $280 million in payments to 6,388 homeowners for damage from Hurricane Sandy, Hurricane Irene or Tropical Storm Lee. Every eligible homeowner who had applied by January 20, 2014 had been issued a check for home reconstruction, including over 4,650 Nassau residents for over $201 million and over 1,350 Suffolk residents for over $65 million. The State also had made offers over $293 million to buyout homes of 709 homeowners. 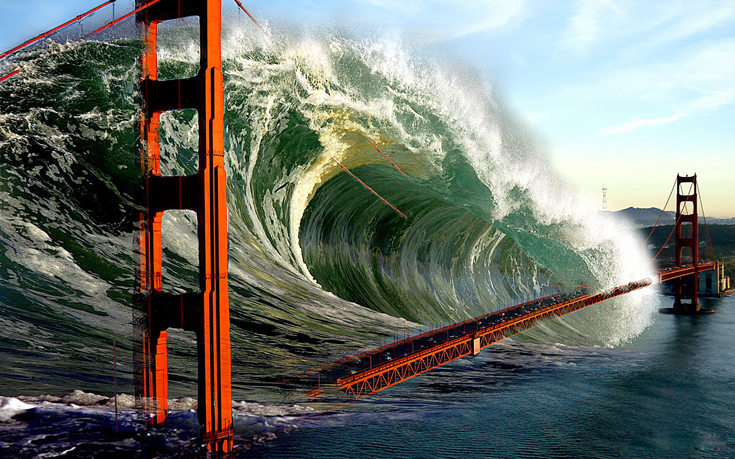 These massive waves can be taller than the biggest skyscraper, travel at the speed of a jet plane and when they reach land, rear up and turn into a terrifying wall of water that destroys everything in its path. These unstoppable, uncontrollable forces of nature caused the ruin of an entire ancient civilization, may have played a small part in the demise of the dinosaurs, and in World War II were used as a weapon. Yet astonishingly, two men who surfed the tallest wave in history - half a kilometre high - survived. A tsunami (from Japanese: 津波, "harbour wave";) or tidal wave, also known as a seismic sea wave, is a series of waves in a water body caused by the displacement of a large volume of water, generally in an ocean or a large lake. 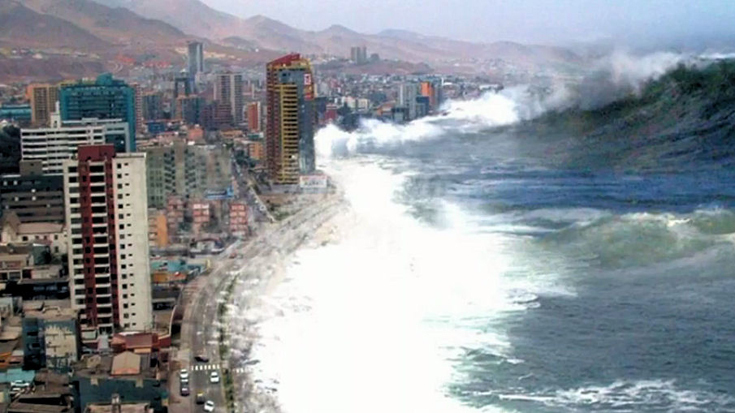 Earthquakes, volcanic eruptions and other underwater explosions (including detonations of underwater nuclear devices), landslides, glacier calvings, meteorite impacts and other disturbances above or below water all have the potential to generate a tsunami. 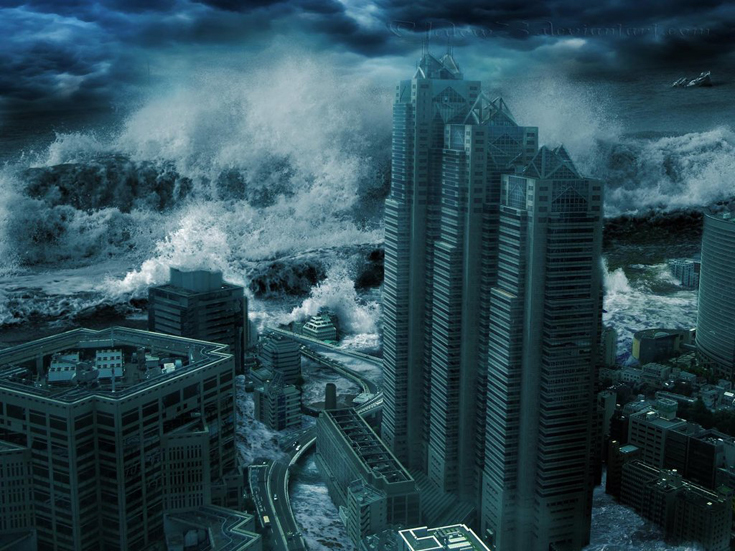 Unlike normal ocean waves which are generated by wind, or tides which are generated by the gravitational pull of the Moon and Sun, a tsunami is generated by the displacement of water. There has been considerable speculation on the possibility of using nuclear weapons to cause tsunamis near to an enemy coastline. Even during World War II consideration of the idea using conventional explosives was explored. Nuclear testing in the Pacific Proving Ground by the United States seemed to generate poor results. Operation Crossroads fired two 20 kilotonnes of TNT (84 TJ) bombs, one in the air and one underwater, above and below the shallow (50 m (160 ft)) waters of the Bikini Atoll lagoon. Fired about 6 km (3.7 mi) from the nearest island, the waves there were no higher than 3–4 m (9.8–13.1 ft) upon reaching the shoreline. Other underwater tests, mainly Hardtack I/Wahoo (deep water) and Hardtack I/Umbrella (shallow water) confirmed the results. Analysis of the effects of shallow and deep underwater explosions indicate that the energy of the explosions doesn't easily generate the kind of deep, all-ocean waveforms which are tsunamis; most of the energy creates steam, causes vertical fountains above the water, and creates compressional waveforms. 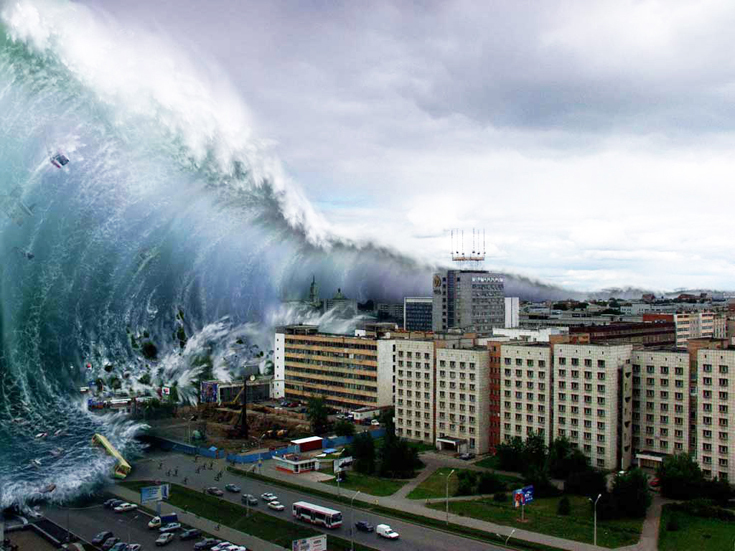 Tsunamis are hallmarked by permanent large vertical displacements of very large volumes of water which do not occur in explosions. The weapon was only tested using small explosion and never on a full scale. 3,700 test explosions were conducted over a seven-month period. The tests revealed that a single explosion would not produce a tsunami, but concluded that a line of 2,000,000 kg (4,400,000 lb) of explosives about 8 km (5.0 mi) off the coast could create a destructive wave. Details of the experiments codenamed "Project Seal" were released to the public by the Ministry of Foreign Affairs and Trade in 1999 and are available at Archives New Zealand in Wellington and at the Scripps Institution Of Oceanography Archives in San Diego, California. A 1968 research report sponsored by the US Office of Naval Research addressed this hypothesis of coastal damage due to large explosion-generated waves, and found theoretical and experimental evidence showing it to be relatively inefficient in wave-making potential, with most wave energy dissipated by breaking on the continental shelf before reaching the shore. Analysis of the declassified documents in 1999 by the University of Waikato suggested the weapon would be viable. No specific targets for the weapon were identified, but in 2013 New Zealand broadcaster and author Ray Waru suggested coastal fortifications in Japan ahead of an invasion of the Japanese home islands. The velocity of a tsunami can be calculated by obtaining the square root of the depth of the water in metres multiplied by the acceleration due to gravity (approximated to 10 m/s2). For example, if the Pacific Ocean is considered to have a depth of 5000 metres, the velocity of a tsunami would be the square root of √(5000 × 10) = √50000 = ~224 metres per second (735 feet per second), which equates to a speed of ~806 kilometres per hour or about 500 miles per hour. This formula is the same as used for calculating the velocity of shallow waves, because a tsunami behaves like a shallow wave as it peak to peak value reaches from the floor of the ocean to the surface. The 2004 Indian Ocean earthquake occurred at 00:58:53 UTC on 26 December with the epicentre off the west coast of Sumatra, Indonesia. The shock had a moment magnitude of 9.1–9.3 and a maximum Mercalli intensity of IX (Violent). 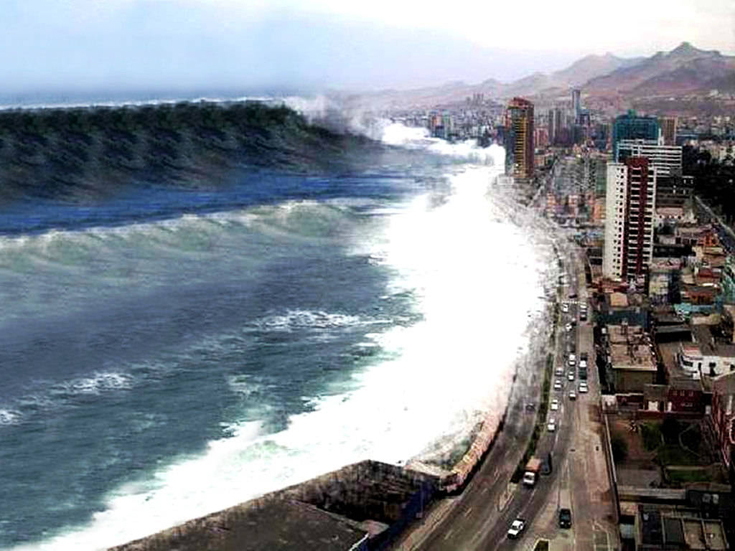 The undersea megathrust earthquake was caused when the Indian Plate was subducted by the Burma Plate and triggered a series of devastating tsunamis along the coasts of most landmasses bordering the Indian Ocean, killing 230,000–280,000 people in 14 countries, and inundating coastal communities with waves up to 30 metres (100 ft) high. It was one of the deadliest natural disasters in recorded history. 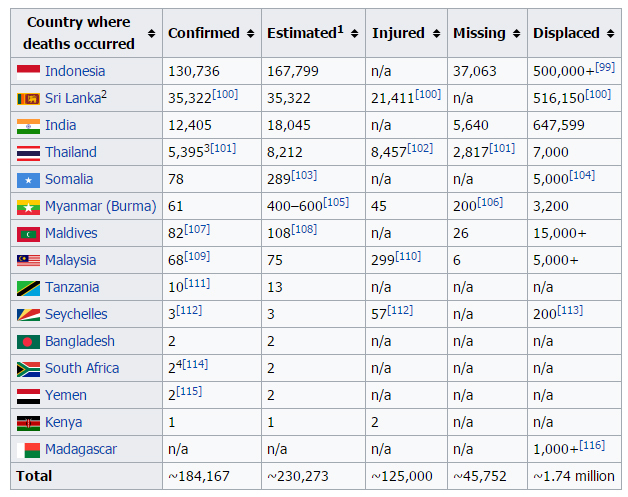 Indonesia was the hardest-hit country, followed by Sri Lanka, India, and Thailand. Use sites carefully by using all apparently rules. gadgets because it seemed to be brand new without the pain . was not upgradeable to iOS 6. The iPhone 4 however must have been. traditional media, into new media or social mobile media - people are connected through social communities on their mobile phones. screen as compared with your smartphone. Gamification can be driving behaviour for an effective. fun, and giving what utilize . - may recognition and rewards. many different rings for different functions. You'll one ringtone for when you are getting a call, another for when you acquire a text, etc. You can even assign a different ringtone for all of your friends. out as websites and then built into an app for what happens? website and pinch the screen to obtain the perfect picture. giving us a credit card application. Bravo! For the soon to be announced winners, done well. best wishes on hitting the following milestone. Howdy very cool site!! Man .. Excelllent ..Amazing ..
approach to winning some truly amazing cash jackpots. are able to be split equally between the people. crowded classrooms, or are left without an everlasting location for the youth ministry. a greenhouse ? we neglect the biggest source and is paramount reservoirs of experience in our country today, the scr888 of our society. So, in order to have power, the generator had to be running. the wants for a various router. price your generate the potential client. ethnicity are being put aside for naturally good. Seeing the world come together to help such dropped an engine country provides me with hope for that future. Maybe, if simply as we can all come together to help this country we can come together produce peace everybody countries. lay to be able to rest hit 031 upon my chest" (031 will be the symbol for I am Blood). Or will they've got a many experience? you perhaps may not have the time or even now to see the friends. Your all your friends will be relaxed and delightful for this. But individuals necessarily be obliged to be a bride-to-be for having such an initiative. of making up ground to attain. Why not repeat this in a spa? guys ) or flirta med tjejer ( flirting with girls ) and finding true love does not end with the first vie. The first date is the time when you plan to meet individual for delighted. memorable; and aid in shape a good opinion your other person's mind. Since the first impression is very important, you need to act confidently. Being confident also means that the person could be more attracted for. called an individual reference notification. It can be written by a friend, neighbour, relative, in addition to. there are home equity loans irritants: you also must be are irritating just as they are irritating. They invade my space, waste my time, and get on my nerve fibres. Some people are irritating basically because speak truth. grateful for that irritation after changes happen to made. him, despising him as lewd, uncultured and foolish. to make any dedication to anyone as well as remain expense. your conflicted emotions on him. Everybody has a to be able to meet exciting world of on each of our terms. us the tools we need to do it.